In this week’s blog I am pleased to announce two important items that are taking place at our new LEX 530 Metropolitan Event Center in Elkhart, Indiana. Executive Chef Chad Coryn joined the LEX 530 team this week. After much deliberation and discussion Mrs. Tiedemann and I decided it was very important for the success of LEX 530 that we hire an executive chef as part of our management team. We felt it was necessary for LEX 530 to become a more successful venture. Concurrent with this decision we were fortunate enough to receive the impressive resume of Executive Chef Chad Coryn for consideration. After interviews, conversations and Chef Chad preparing a dinner for a specially selected group of guests, I am pleased to announce that he agreed to join our LEX 530 team. 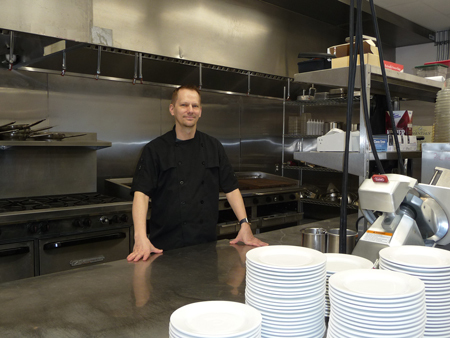 Chef Chad Coryn comes to us with 28 years of professional cooking experience in various kitchens and restaurants. In the early years of his professional career he worked in various chains and breakfast restaurants learning the art of cooking. After these positions he spent a long period of time at Elkhart General Hospital where he says he learned exceptional cleanliness and management skills. In more recent years he served as Sous Chef at the restaurant Indigo on 17 where he was quickly promoted to Executive Chef. After Indigo on 17 closed Chef Chad moved to a couple of smaller restaurants until he went to work at Fat Cam’s at Garver Lake restaurant in Edwardsburg, Michigan, where he served in several positions as well as Executive Chef for the past five years. Not only does Chef Chad bring years of practical experience to this position but he also possesses a great number of key skills necessary to make any kitchen successful. These skills only come with experience and will be very important to the LEX 530 operation. Some of these skills include menu development, teaching skills (which are necessary to develop other kitchen staff members) and strong time management skills. Chef Chad has an associate’s degree in Culinary Arts from Ivy Tech where he is also a teacher. The management team at LEX 530 is very excited to have Executive Chef Chad as a part of our team. 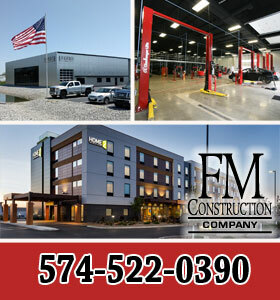 His experience allows us to move the event center forward on a number of fronts. This brings me to my next announcement. With the addition of Chef Chad to our team we are ready and pleased to also announce that we are forming the LEX 530 Wine & Dinner Club. This will replace our current Tiedemann On Wines Wine Club. We certainly hope that our existing wine club members will continue on as LEX 530 club members. The new club will incorporate the benefits of the old club and proved an array of expanded benefits to members and guests. A dinner club is a group of people who get together on a regular basis. In our case we are planning monthly events, to enjoy food, wine and meet new friends or connect with old ones. Anyone is invited to our events but official club members will receive the membership benefits. 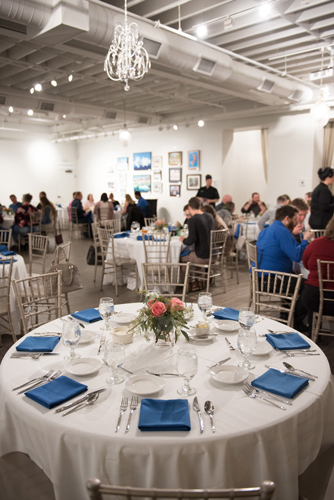 The LEX 530 Wine & Dinner Club is planning monthly events to enjoy food, wine and meet new friends or connect with old ones. Many of our events will take place at the LEX 530 event center in Elkhart. Our primary goal is to provide our members and guests with unique dining and wine tasting opportunities and much more. The club’s goal is to create dinners with themes prepared by our own executive chef or have him team up with guest chefs from throughout the Midwest. All of the wines will be hand selected to pair with the food by myself and other knowledgeable wine professionals. So what are the events we have in mind? These individuals will come to LEX 530 and be a part of a team who will prepare a dinner for members and guests. The themes will focus on the preparation of meals served. We hope to have Morton’s Night, Temper Grill Night, etc. German night where we’ll prepare typical German food with Austrian and German wines selected by wine importer Manfred Bauer of Wine-Bauer Inc. in Chicago. Other winemakers and wine experts have agreed to participate in events as well. 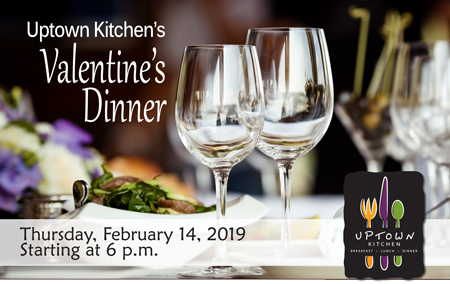 Carl is partnering with Uptown Kitchen for its Valentine’s Dinner on Thursday, February 14. Click on this image to see the menu and wine pairings. 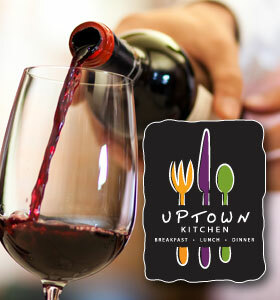 We will continue to work with Uptown Kitchen, our original Tiedemann On Wines Wine Club partner, to provide exclusive events at both Uptown Kitchen as well as LEX 530. As an example we are participating in Uptown’s Valentine’s Day Dinner on February 14. We also have a steak and oyster dinner in the works for March 18. However the location of that event has yet to be determined. The goal and vision of the wine and dinner club is to expose its members and guests to an array of exceptional food and wine on a regular basis. The LEX 530 Event Center in the developing Elkhart River District is designed especially for such exclusive events. 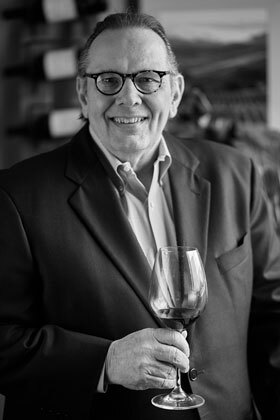 Purchase your LEX 530 Wine and Dinner Club annual membership for $95.00 by credit card through the blog at https://tiedemannonwines.com/join/. You may also mail your check to: LEX 530 Wine and Dinner Club, 530 E. Lexington Ave., Suite 175, Elkhart, IN 46516; or simply stop by our offices to pay in person. Hi Carl: Does the membership include member and guest or is it a per person membership? Hi Linda. There is only one person per membership. But when you come to a LEX 530 Wine Dinner event as a Wine Club Member, you would get a 10% discount for yourself AND for your guest. The cost of the events will be per person. For example, if the cost is $80 per person for an event, a LEX 530 Wine Dinner Member would pay 10% less for themselves AND for their one guest (for a total of $144 for two people to attend versus $160 for the full, non-member price). Let me know if you have a further questions. We are impressed with all that you are doing to further your friends’ and clients’ experiences with your new event center. Keep up the good creative work! What is the typical cost of a dinner?